Paintings found deep in the caves of Southwest Europe give us a glimpse into the world of the earliest artists. It appears that we as a species have always had the need to express ourselves through our ability to capture our world via visual imagery. Our earliest ancestors’ talent to preserve their observations through their creative genius is astonishing. Mixing plant and mineral colors with water, fat and other viscous substances, they created images throughout Southwestern Europe as early as 35,000 years ago. 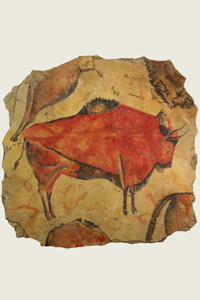 Although 99.999 percent of these works have been lost through the eons the discoveries of those remaining in the stable environments deep in the Iberian caves are well preserved. The powerful works of these early artist are demonstrated by their attention to detail, the ability to capture the essence of motion, the use of shading to show dimension and a use of perspective not utilized in history until the 15th Century. Animal subjects portrayed in 3/4 view, some larger, some smaller are shown in various activities of resting, eating, playing, fighting hunting and being hunted. Among the works of animal portraiture are crude images of hand silhouettes and stick figures that may have been the work of bored children hanging out while the adults created their timeless masterpieces. View our other unique art collections.